Contributed by Jodi Kearns & Cathy Faye. On June 29, 2017, we participated in a teacher workshop on immigration at Stan Hywet Hall & Gardens. Stan Hywet offers an educational program called “Meet the Staff” for middle school students to come with their teachers and learn about the staff who, around a hundred years ago, did the baking, cleaning, groundskeeping, horse training, and other house and garden jobs. Stan Hywet is the name given to the mansion built and owned by the Seiberling family. F. A. Seibering founded the Goodyear Tire and Rubber Company. To be admitted to the United States in the early 1900s, immigrants had to be free from physical illness. They had to be capable of earning a living. But they also had to be free of “mental defect” and possess adequate mental ability. In the early 1900s, US immigration officials were therefore looking for a way to screen out “mental defectives” among the more than 5,000 immigrants that sought entry into the United States every single day. Congress had passed laws that barred “lunatics,” “idiots,” “imbeciles,” and “the feeble-minded” from entering the United States. These labels, used today as insults, were at the time diagnostic categories, indicating varied levels of intelligence. For example, a “moron” was anyone who scored 70 or below on standard intelligence tests of the day. After initial inspection, some immigrants were triaged into a separate line for further inspection, which involved a battery of psychological tests that were designed to be useful in cases where language skills were a barrier. The three tests used at Ellis Island that we demonstrated for the teachers are Cube Imitation Test; Form Board Test; and Feature Profile Test. An Akron-area teacher demonstrating the Form Board Test. After a brief history and demonstration on the original artifacts, Jodi told the teachers that they would come to their classrooms and teach this lesson on Ellis Island psychological testing. In order to do this, we fabricated each of the tests using foam core and wood. Additionally, we recreated the tests with administration and scoring instructions on paper, so each students can have a turn being both tester and immigrant. To the left, a teacher works on the Form Board Test. To the top, another works on the Feature Profile Test. In the blue box, notice the edge of the Cube Imitation Test. This test kit shows examples of the fabrications of the original tests. Teachers working on the Feature Profile Test. Finally, we wrote a full lesson plan and mapped the learning objectives to the Ohio Department of Education standards for social studies, to the American Library Association standards for information literacy, and to the American Psychological Association standards for teaching high school psychology. Teachers can use the lesson and test kits on their own, or invite us to come join them. Have a look at the lesson plan: EllisIsland_LessonPlan_Final. – contributed by Rhonda Rinehart. 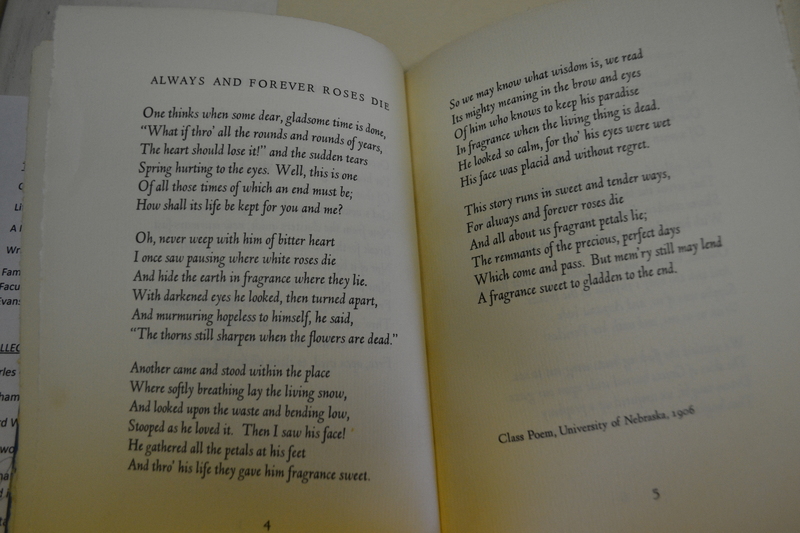 April is National Poetry Month. 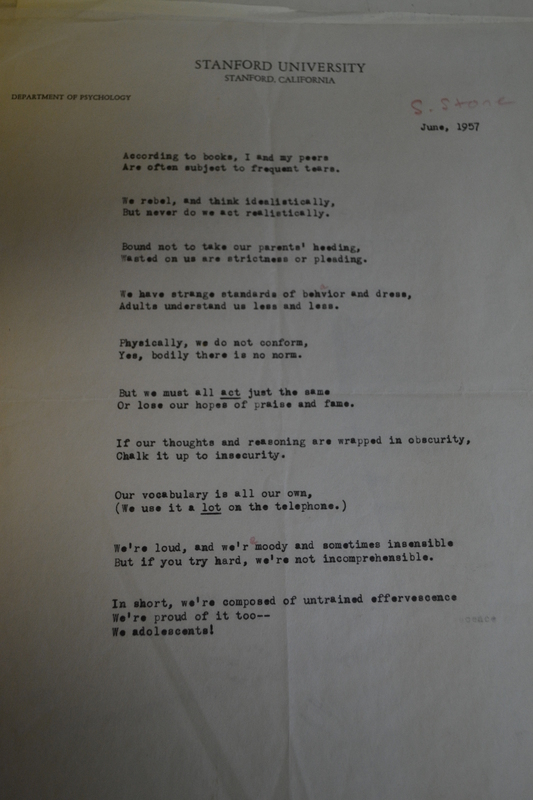 In recognition of all of those terrible poems you wrote in high school, and in honor of armchair poets everywhere, CCHP is posting a blog about creativity. What makes “good” poetry, and how do you know when you see it? Can poetry be judged on simple merits of being good or bad? If poetry is subjective and arcane, why would we attempt to judge it by a simple scale of good or bad? Or by a right way or wrong way of writing it? Maybe it’s an attempt to make the unscientific more scientific. Perhaps the more pressing question is, should we judge it from those perspectives at all? 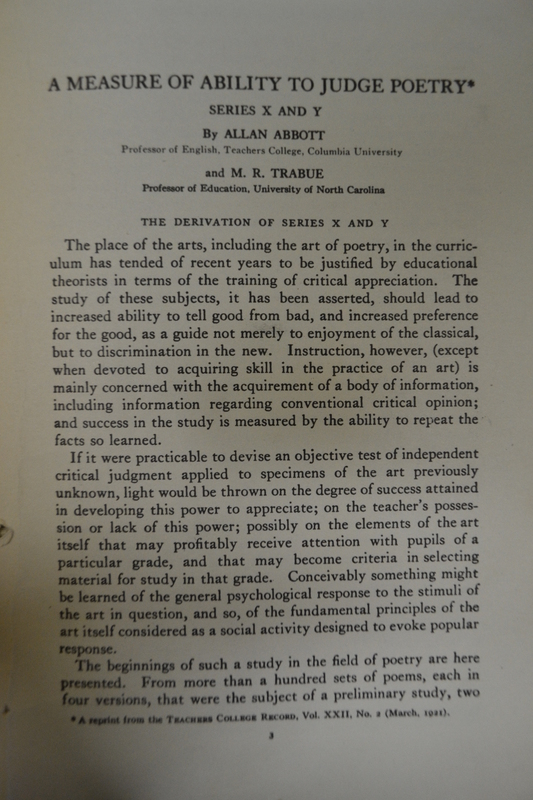 Two professors – one of education and one of English – developed “A Measure of Ability to Judge Poetry” in 1921, to assist students in acquiring an “increased ability to tell good [poetry] from bad, and increase preference for the good”. 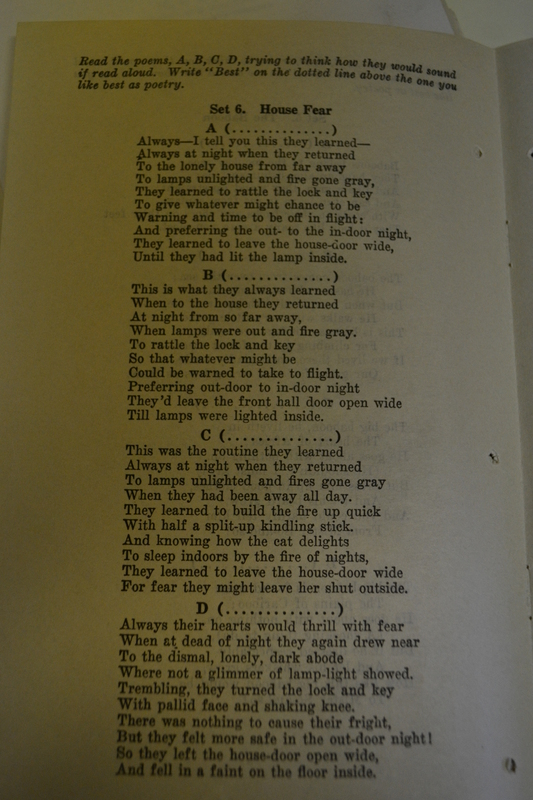 To do this, original poems were sampled, accompanied by sets of varying versions of the original that represented sentimental, prosaic, and metrical forms of writing. From there, it was simply a “which do you prefer?” choice. 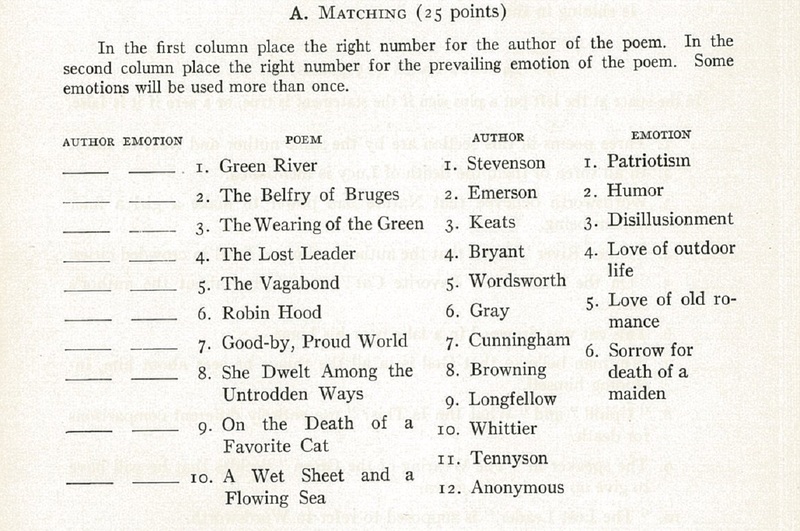 Similarly, “Literature Tests to Accompany Adventures in Prose and Poetry”, a test developed by Rewey Belle Inglis, asks students to determine prevailing emotions of various poems from a given set of emotions. But making constrained decisions about something that is personal and subjective from pre-selected lists and writing samples feels a little restrictive. Instead of right and wrong answers, or answers that are compared to regulated determinates, tests like “The Symbolic Equivalents Test”, allow for more fluctuation in the answers. Rather than judging one’s ability to recognize the good and the bad from staid lists, the test-taker is asked to think of his or her own ways to answer each sample. Answers might feel less like straight answers, and more like cleverness and ingenuity. Indeed, creative writing (in the form of poetry or prose) should feel this way. 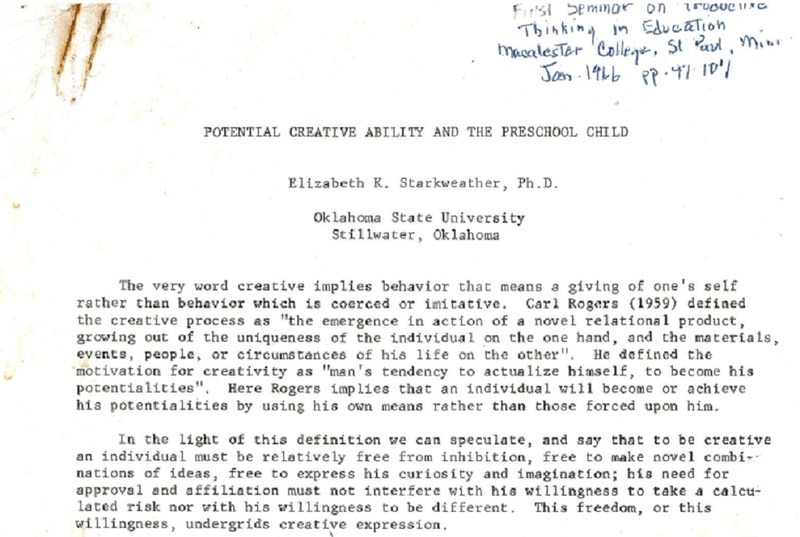 Throughout the 1960s and ‘70s, Elizabeth Starkweather conducted research on the subject of creativity, particularly in school children. She describes creativity as something that cannot be coerced, and in order to take place, it must happen in an environment of free expression without inhibition. Whether taking a test on one’s own abilities or judging others’ creative abilities, we might be wise to ruminate on the ideas posed by Starkweather, Carl Rogers, Abraham Maslow, and others who recognized that creativity has a lot to with the act and less to do with judging other creators’ works. Think, too, about how the act of creating serves an important purpose in those self-actualization theories. Your poems may get published, you may get recognized for being a great talent; but probably not. Write them anyway. In the mechanized grind of life, creativity helps us to feel human. 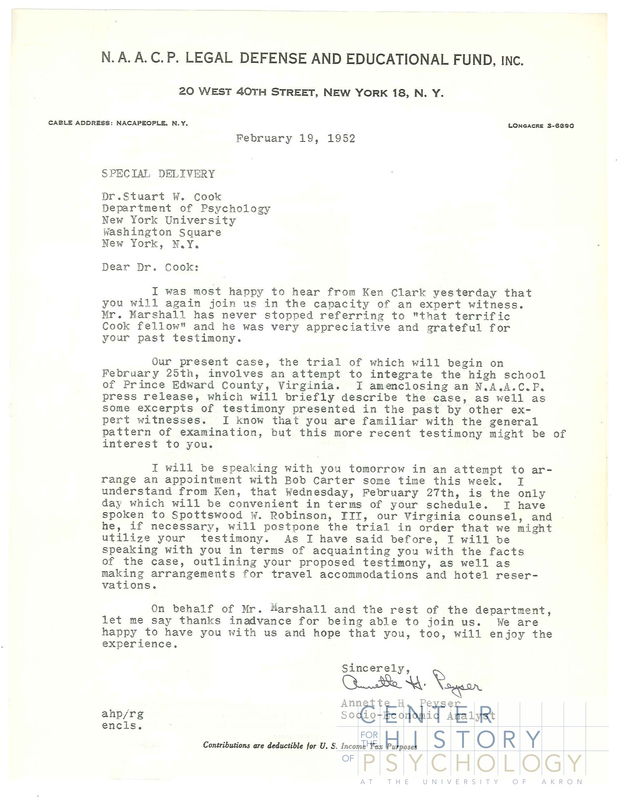 Fall 2015 will mark the 50th anniversary of the Archives of the History of American Psychology. The April 2015 book-of-the-month selection pays tribute to this rich history that CCHP staff and students have dedicated the past 50 years to preserving. 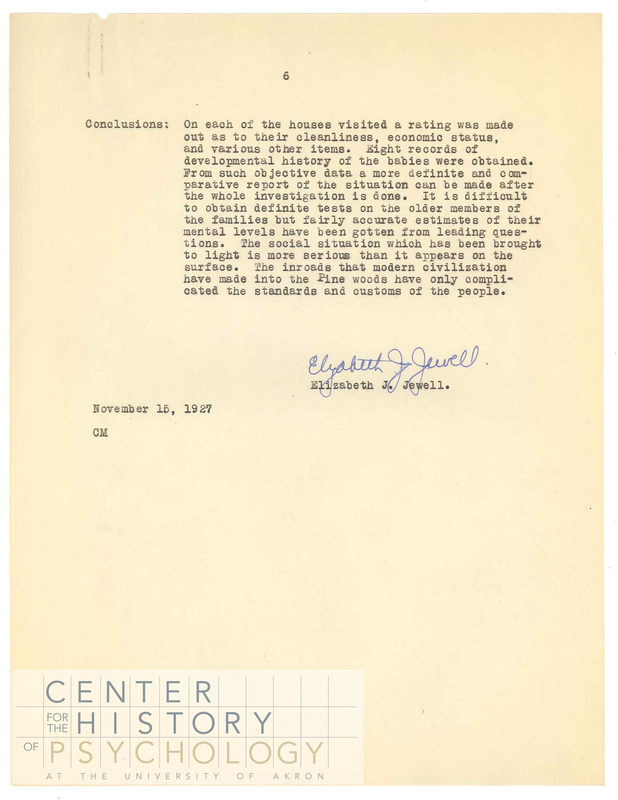 In 2015, the mission of the Cummings Center is to support access to the complete historical record of psychology and related human sciences in order to foster understanding of the human condition. 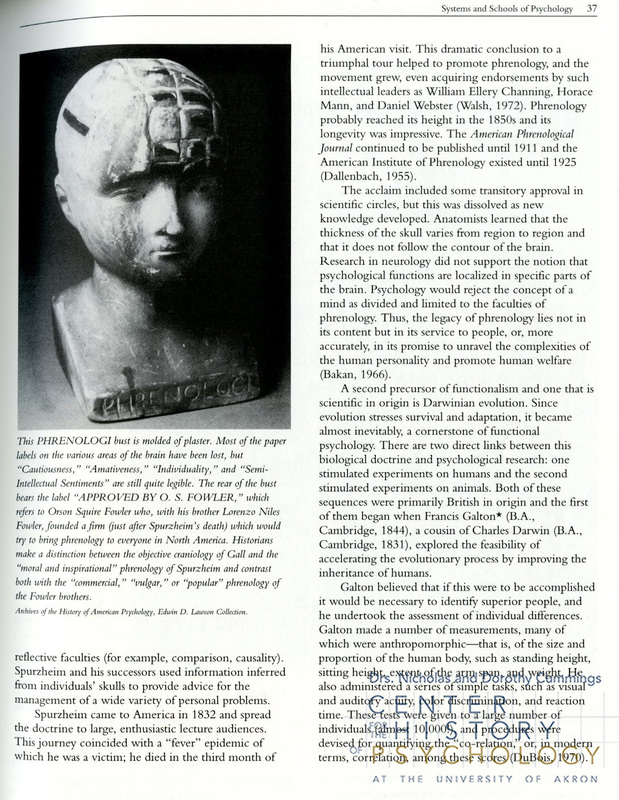 The Illustrated History of American Psychology, 2nd edition, published 17 years ago, was an early project in providing access to the historical record of American psychology. Populated largely by photographs and digitized materials from CCHP collections and written by the co-founders of the Archives, Drs. John A. Popplestone and Marion White McPherson, the Illustrated History describes in words and illustrations with more than 350 pictures the (at the time) just over 100-year story of American psychology . The book visits experimental psychology laboratories, writings and works of prominent figures, military testing for intelligence and vocation, and more. The photographs and objects from the Archives in the Illustrated History are still in the CCHP collections today. Additionally, images in the Illustrated History of manuscript papers and testing materials remain in the CCHP collections and available to researchers. Dorothy Gruich, CCHP Coordinator, helped Drs. Popplestone and McPherson put the first edition together while she was an undergraduate student assistant at the Archives. Please visit the University of Akron Press for information about other CCHP publications. Ever wonder what your personality says about you? Well, there’s a test for that. What about your IQ or achievement? There’s a test for that too. Would you like to be able to have someone tell you what career to choose? Well, you’re in luck because there’s a test for that too! For more than a century, psychologists have designed and administered tests and measures to assess many different kinds of human abilities and characteristics. 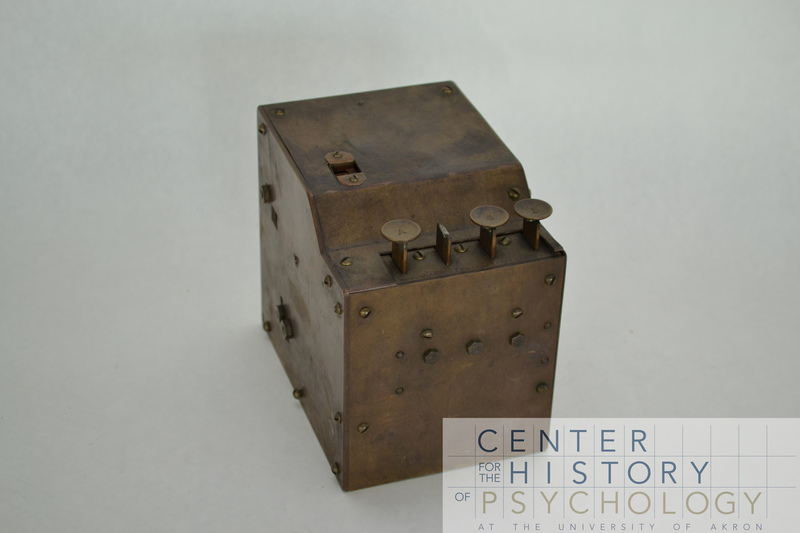 The history of psychological testing is long and varied. It has roots in ancient China; where the emperor instated proficiency testing on topics such as civil law and fiscal policies for public officials. From phrenology to vocational testing, scientists and practitioners have been fascinated with developing new ways to “measure the mind”. Historically, psychological tests have been used in very diverse ways across a variety of settings. 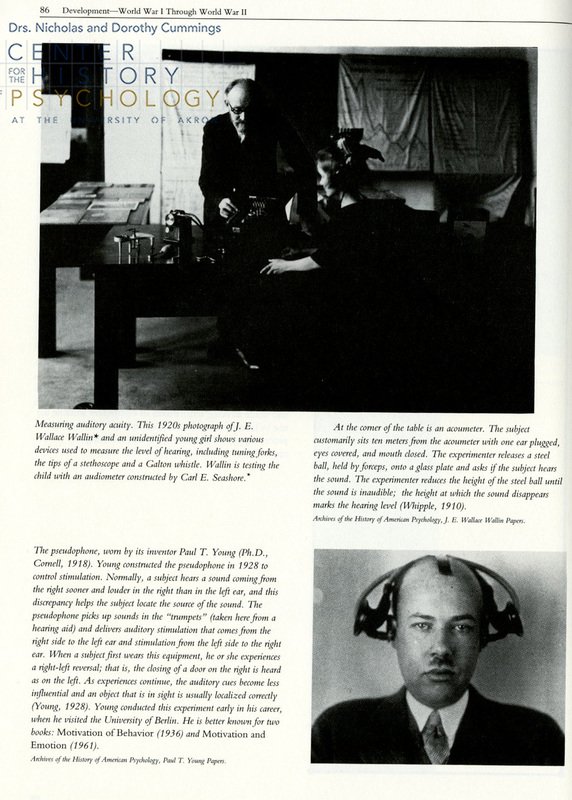 The Cummings Center for the History of Psychology is featuring a new exhibit called “Measuring the Mind” that showcases some early ways that psychologists have measured different abilities and characteristics. 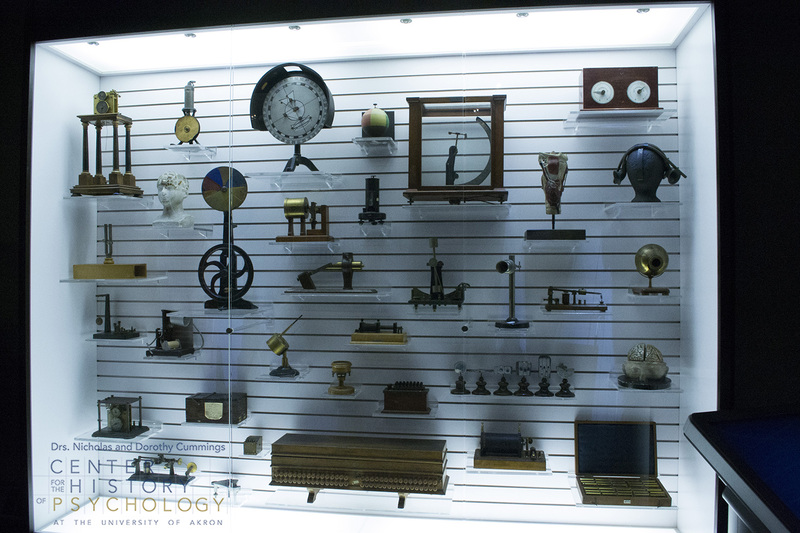 Funded by the Institute of Museum and Library Services through the “Museums for America” program, the exhibit gives visitors a chance to see and interact with tests and measures dating from the nineteenth century to the present. The exhibit features a 1921 home economics test for 8th grade girls that measures knowledge of “household arts” such as clothing care and repair, childcare, and budgeting. The 1919 Woodsworth Personal Data Sheet, which measures potential emotional difficulties among WWI recruits, was specifically designed to identify soldiers who might be at risk for shell shock, which we now know as post-traumatic stress disorder. 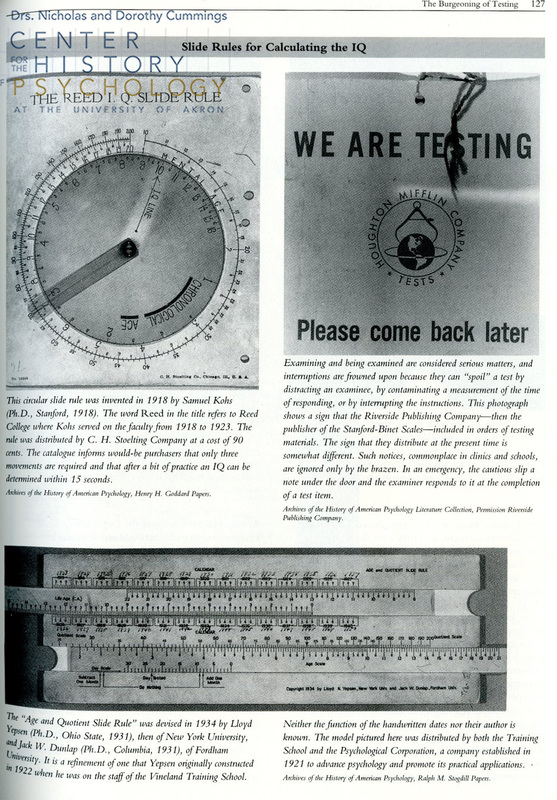 A black-and-white 1935 film depicting the different tests used to measure mechanical aptitude among potential employees is also highlighted. 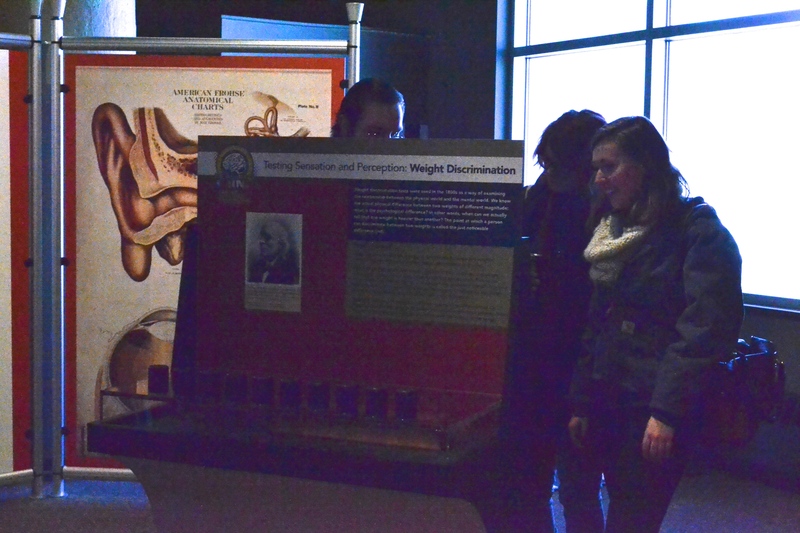 The exhibit also features a variety of interactive displays. Want to test your mental acuity? Check out the weights discrimination test used in the nineteenth and early twentieth century as a way of examining the relationship between the physical world and the mental world. Do you wonder about your motor learning ability? 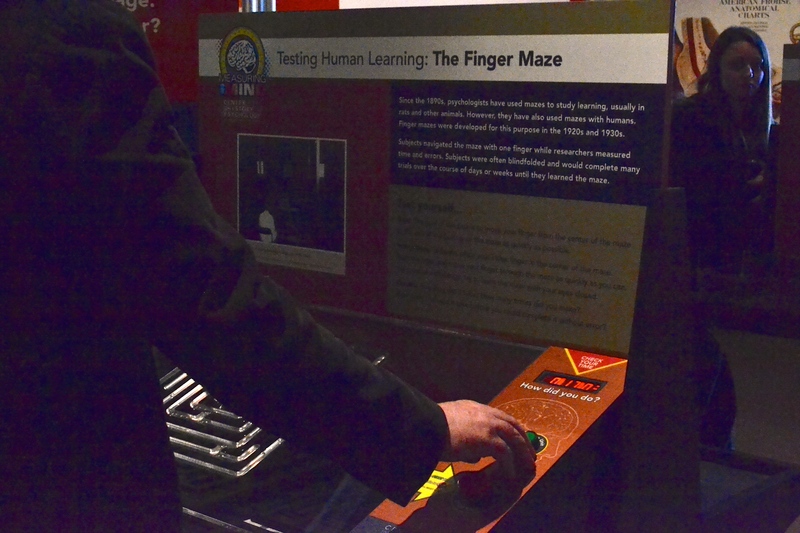 Check out the finger maze, developed in 1928, used to select employees for jobs requiring fine motor skills. Want to measure your intelligence? Check out the form board intelligence test from the nineteenth century and time yourself to see how quickly you can complete the board. 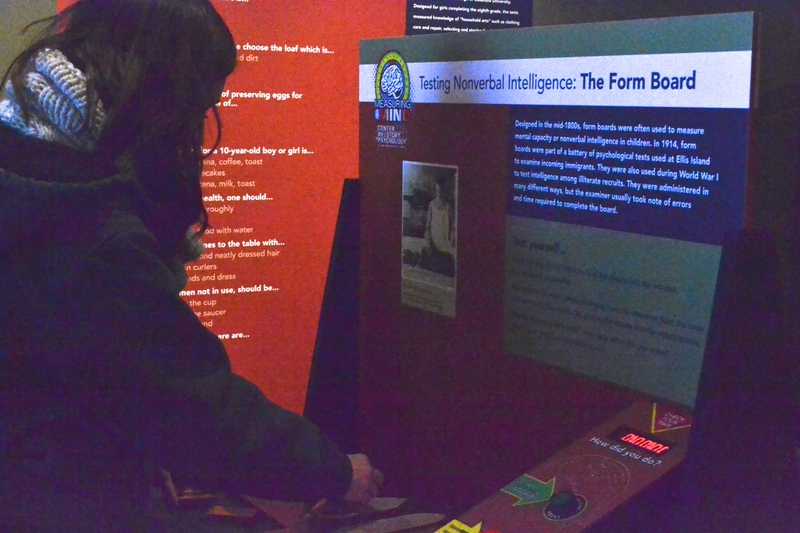 Form boards were used in a variety of situations including: measuring mental capacity and nonverbal intelligence in children, as part of a battery of tests used on immigrants at Ellis Island, and during WWI to test intelligence among illiterate recruits. 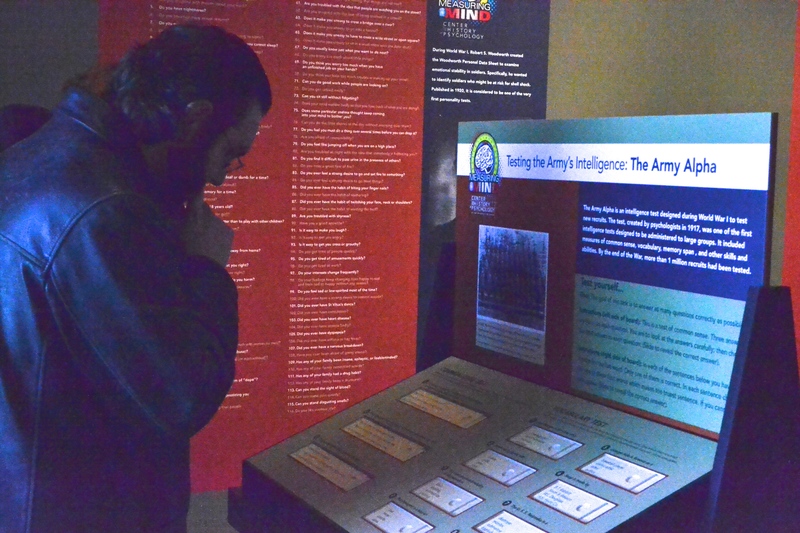 Visitors can also test their intelligence through the Army Alpha interactive display. Developed in WWI, the Army Alpha was the first intelligence test designed to be administered to large groups. This test was used to test new army recruits and by the end of the war, more than 1 million recruits had been tested. 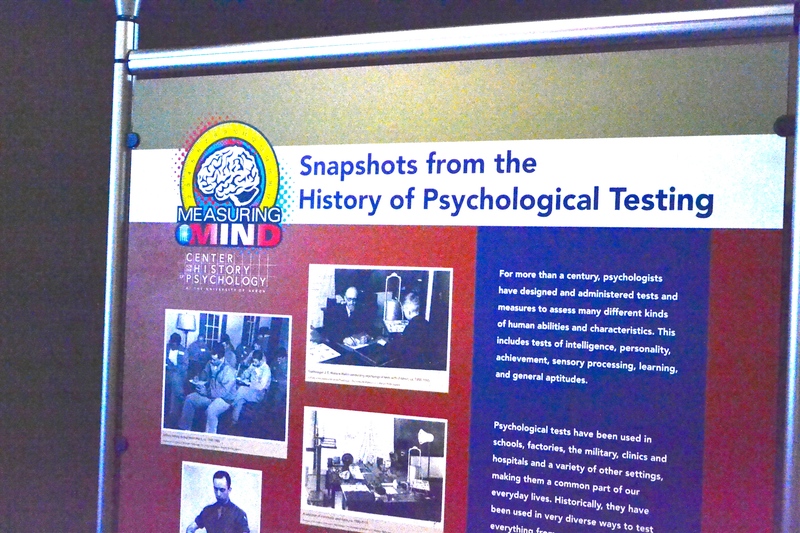 For more information about these tests and many more pay a visit to the Cummings Center for the History of Psychology to check out our “Measuring the Mind” exhibit. 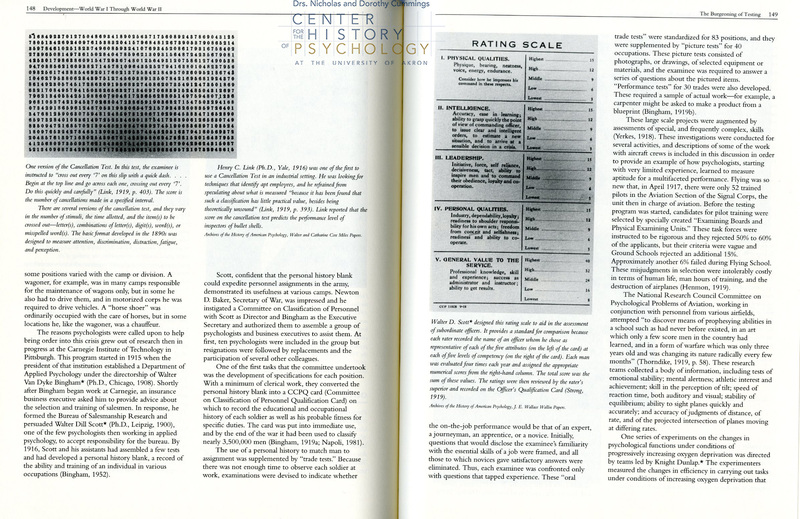 You can also schedule a research visit to examine our vast collection of psychological tests and measures. Something for Everyone at the CHP! -Contributed by Lizette Royer Barton. Recently, Jodi brought several students from her Information Literacy course to the Center to learn about archives and primary source materials. One goal was to show the students that even though they may not be majoring in psychology or history they could still locate materials relevant to their field of study at the CHP. 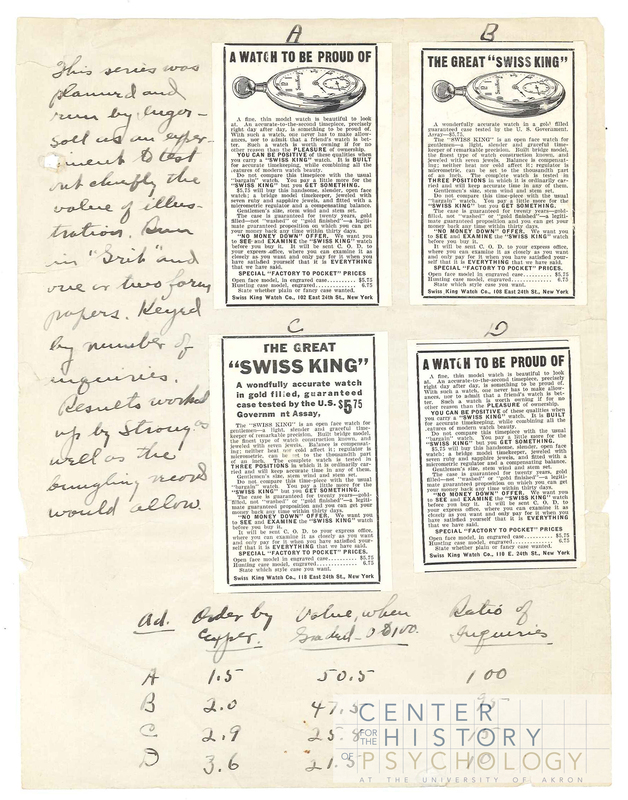 One student is a business major so I talked a little about psychology’s place in the history of advertising and I showcased some materials from the Harry L. and Leta Stetter Hollingworth papers. Another student is majoring in social work, a field that is very connected with psychology. 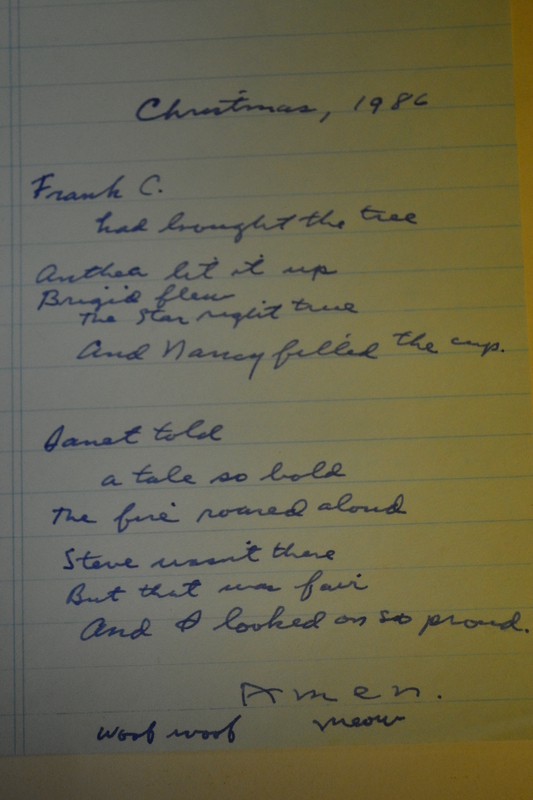 We looked at field and case notes written by Elizabeth Jewel and Elizabeth Kite in the 1920s from the Vineland Training School papers and we talked about the importance of having good interviewing skills when working with clients. This led to a brief discussion of one of psychology’s earliest experimental methods – introspection. There was a student interested in studying law so I decided that one of the best examples was psychology’s role in the landmark Brown v. Board Supreme Court Case. Kenneth and Mamie Phipps Clark’s work was specifically presented to the court but psychologists were also involved in several desegregation cases that led up to and were eventually part of the 1954 case. Here is a great example from the Stuart Cook papers referencing a desegregation case in Prince Edward County, Virginia. I was really excited to search for relevant materials for the student majoring in the culinary arts. We talked about the CHP blog post where we highlighted dinner menus and how food trends seem to constantly be changing. We also talked about wartime work done by psychologists Josef Brozek (starvation studies) and Kurt Lewin (wartime food habits). 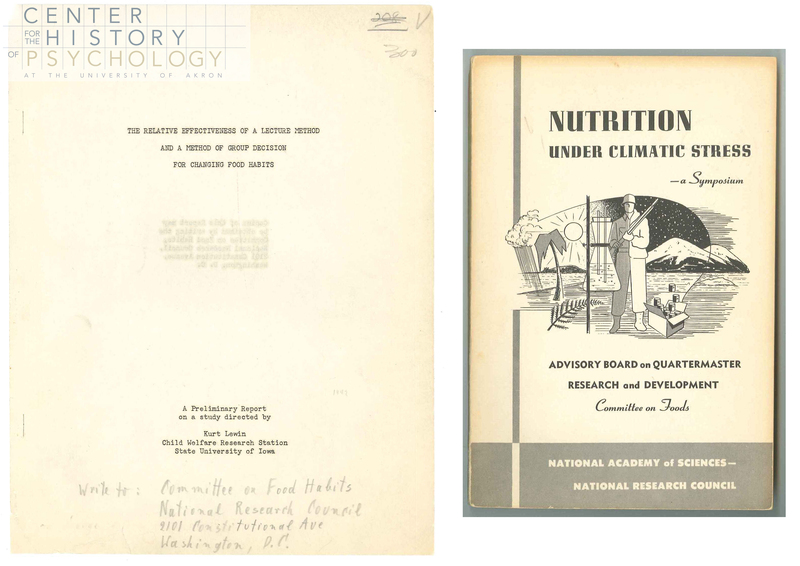 Exhibited here is a report by Lewin for the Committee on Food Habits and a book from the CHP Book Collection about a symposium held on wartime nutrition for soldiers. Two of the students in the class are studying computer networking so I dug into the CHP Artifacts collection to share examples of early computers. We started with an original Sidney Pressey Teaching Machine (pictured below) and moved on to the 1984 Apple II. Then we had a conversation about how fast technology changes! And finally there was the student who is majoring in nursing. In searching the collections I located numerous references to psychiatric nursing. We took a look at 1950 newsletter of the Group for the Advancement of Psychiatry and a questionnaire that was created by the group’s Committee on Psychiatric Nursing. It’s always pretty amazing–even to us–to see the reach of psychology into all corners of society and Jodi’s class visit just reinforced for us the importance of preserving the CHP collections and making them available to the widest audience possible. Yesterday, we posted a visual quiz to the CHP facebook page, showing the image below and asking the pressing question: what is it? I know, I know…the suspense has been killing you! 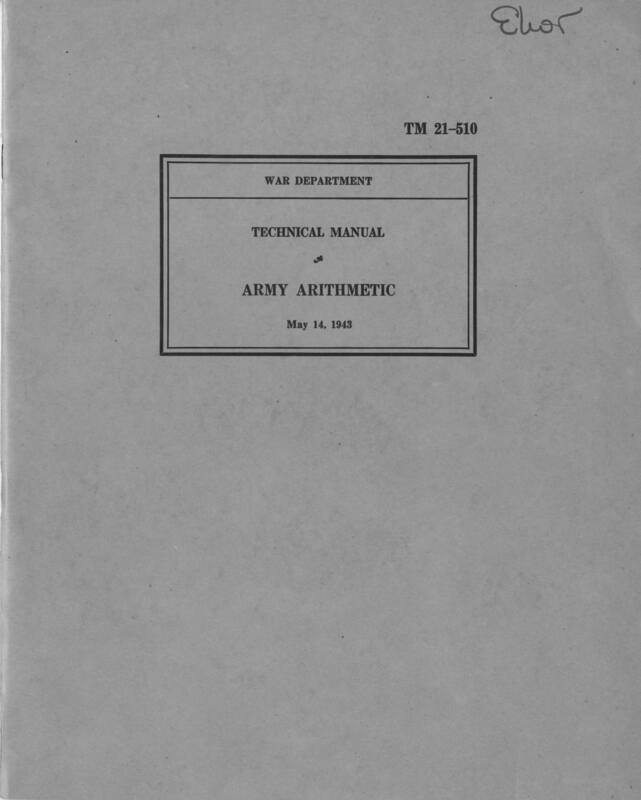 Well, here’s the short answer: It is a technical manual on arithmetic, issued by the U. S. Army on May 14, 1943. Now here’s the longer (dare I say, more interesting!) answer. Manuals like this were designed for recruits with below average reading, writing, and math skills. 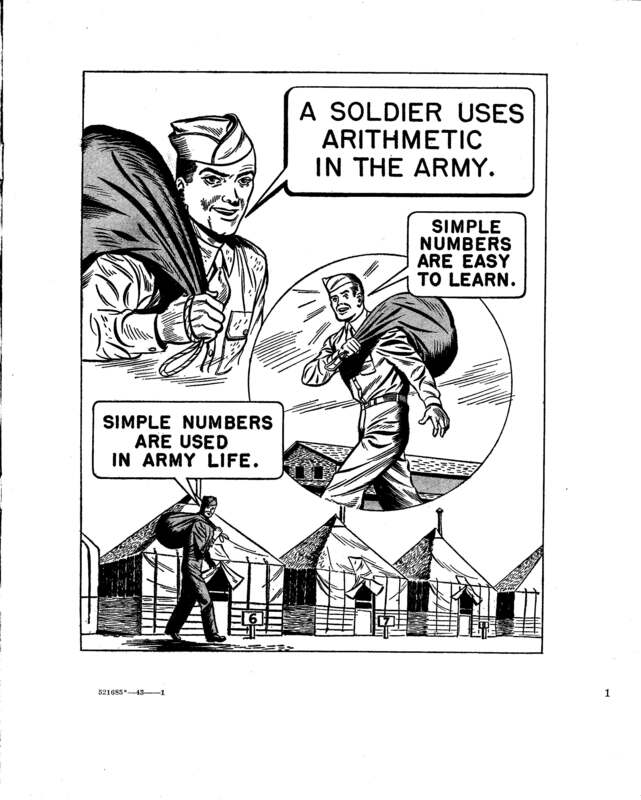 Without extra instruction, such recruits were deemed unfit for basic military training. Instead of being turned away, they were sent to Special Training Units, where they received basic educational instruction to get them up to speed in these areas. 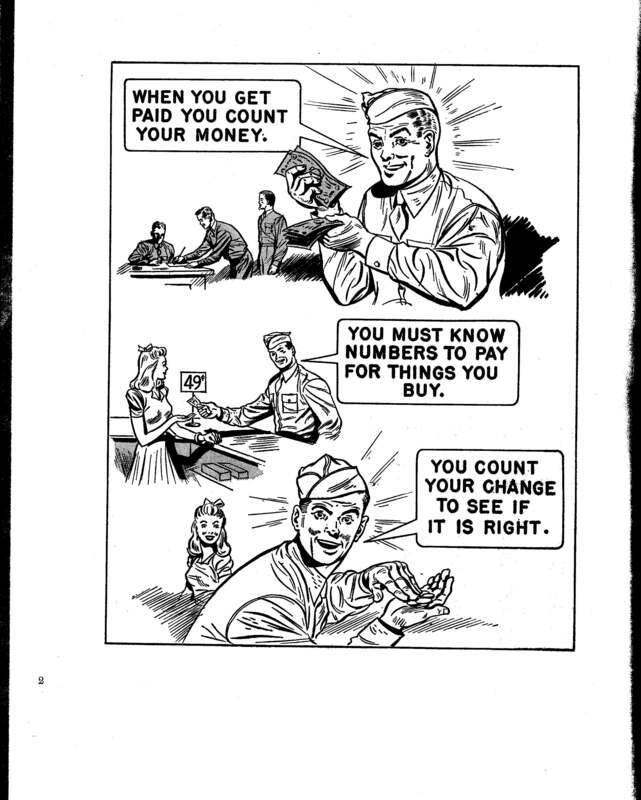 Recruits would first pass through a “Reception Center”, where they received their clothing, inoculations, primary classification interviews, and a basic orientation to Army life. Then, those that were deemed unfit due to subpar academic skills were transferred to Special Training Units. At the Special Training Units, instructors used manuals and quizzes like this to improve recruits’ skills. 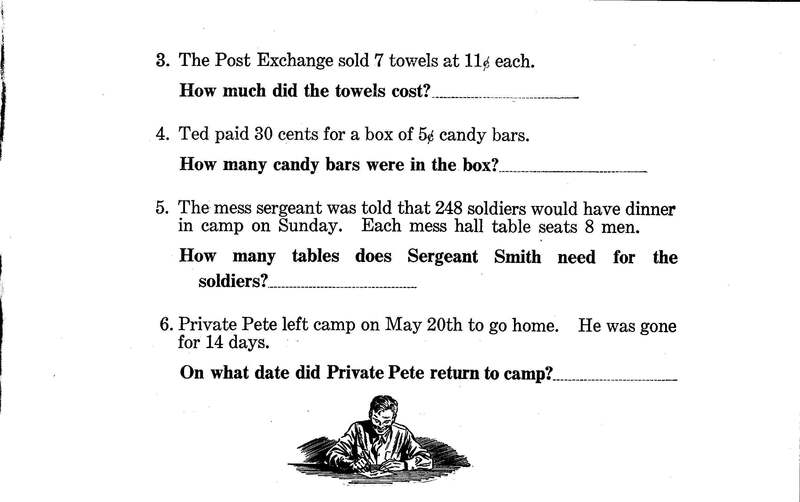 Notice the reference to “Private Pete?” He was a recurring character throughout the learning materials. The manuals are full of really interesting images, which makes sense; they were designed to be rich with visual aids, since the majority of these recruits were categorized as having below-average reading skills. Interested in seeing more? The entire manual is available here in the CHP Digital Repository. Be sure to follow us on Facebook so you don’t miss these fascinating finds. Or, if you have the time and the inkling, go hunting through our vast collections yourself! The Ohio State Penitentiary stood in downtown Columbus for 150 years and held the likes of poet O. Henry and Dr. Sam Sheppard. The CHP Test Center houses several tests and guides that were developed, adapted, and used to assess psychological profiles of inmates in the Ohio State Pen. 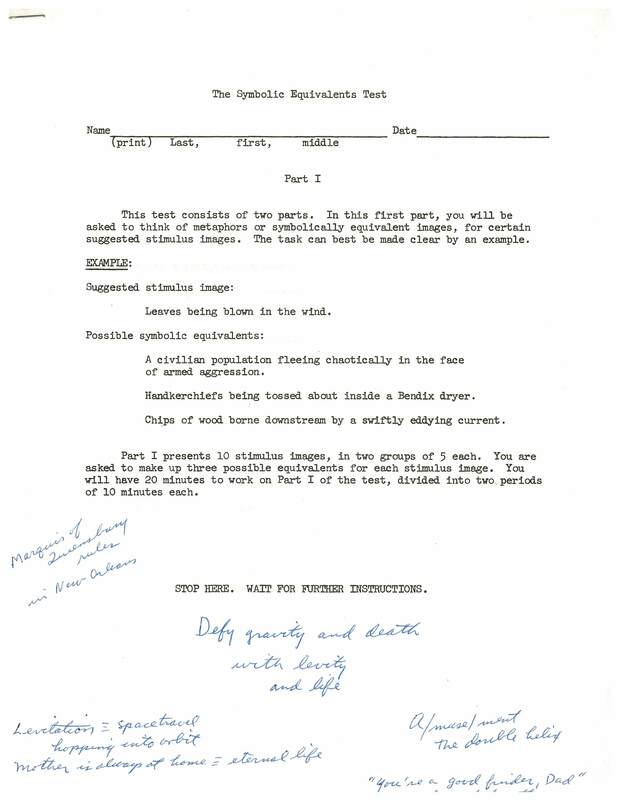 The tools I’m about to show you were implemented during the first few years of Sam Sheppard’s incarceration, specifically in the late 1950s. This snippet from a sentence completion test shows the sorts of opinions an inmate could give about (#9) the men they bunk near, (#12) recreational time, and (#22) inmates in the Honor Dorm. 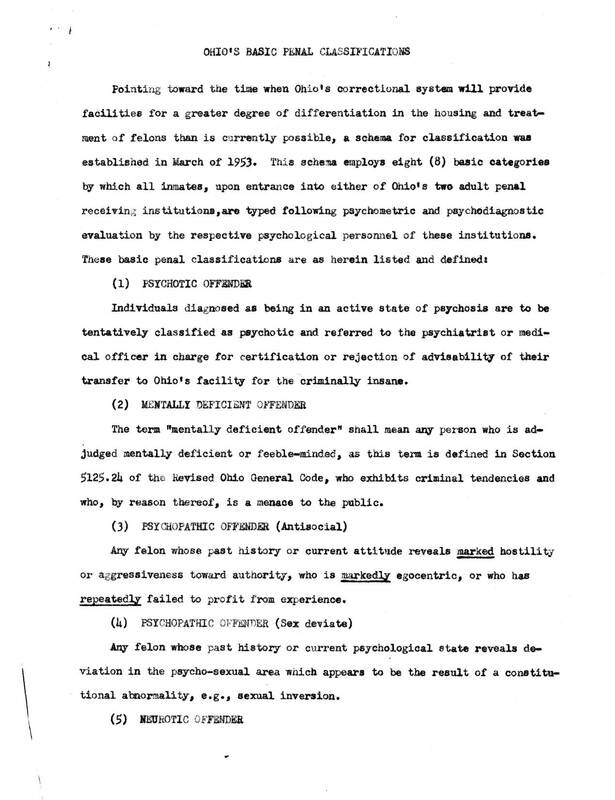 The first page of this guide describes Ohio’s Basic Penal Classifications, such as (#1) Psychotic Offender, which shows that inmates in an active state of psychosis ought to be “tentatively classified as psychotic” and referred for further assessment. This classification schema was used for placement and treatment based on psychometric and psychodiagnostic evaluation. 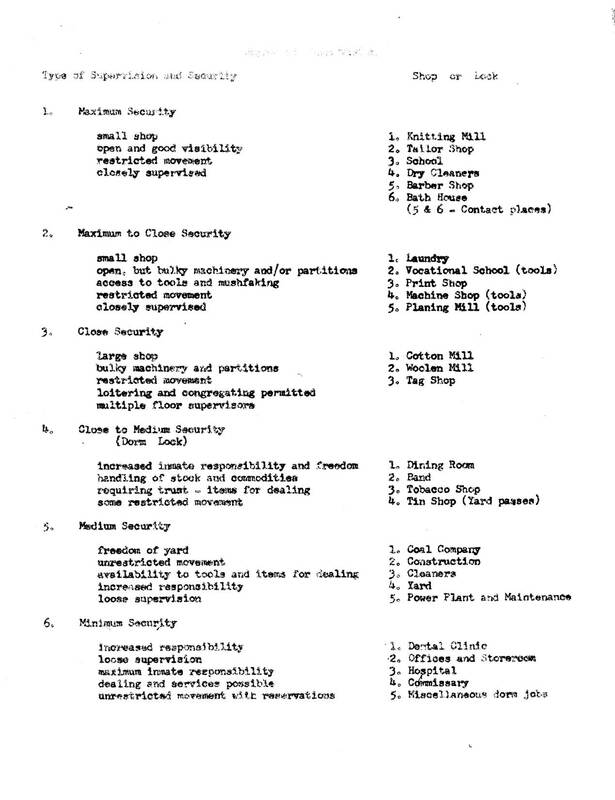 Difficult to see, this guide is called “Degree of Supervision” and explains that an inmate in Maximum Security needs to be placed for work detail in a small area with restricted movement, open visibility, and close supervision, like in the prison’s knitting mill, school, or barber shop. An inmate in Minimum Security can be given more responsibility than the other levels of security, and may work in the hospital or commissary. To see these assessment items in their entireties and to read the others in this collection donated by Dr. Alfred H. Fuchs, please visit CHP Test Center online.